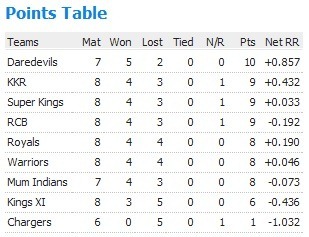 Having won the last game against Chennai in Chennai, KXIP will be much confident than RCB who had a washed out game. David Hussey won the toss and decided to field first, RCB lost Mayank Agarwal early, but Kohli & Gayle came together to gel in a good partnership for RCB which longed for 119 runs for the second wicket, just when both looked set and ready to launch the assault, both had been dismissed. 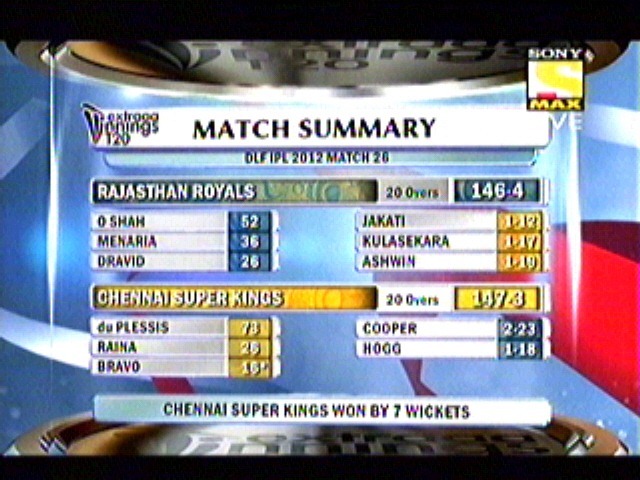 Also some very good death bowling from KXIP ensured RCB fell two runs short of 160 mark. Azhar Mahmood being the key player in which KXIP allowed only 30 runs in last 5 overs. KXIP needed 8 runs an over to chase the target, in form player Shaun Marsh went for a expansive drive which exposed the bat pad gap, for McDonald to seize the opportunity, he went for 8. Mandeep Singh & Saini got together for a small time got a fifty partnership in no time after Mandeep Hussey joined Saini for another 50 runs partnership, which almost took KXIP to the door of victory. But all of a sudden some frenetic running between wickets costed KXIP 3 wickets in 8 balls to get the equation to 5 runs of last 6 balls, with 2 new batsmen in the crease. How ever Chawla ensure he is no muck with the bat, who slammed the length ball into the crowd in the penultimate ball to seal the victory for KXIP. – Praveen Kumar bowled the most economical spell for this season, 4-0-8-0, he had 16 dot deliveries in the 24 balls he bowled and rest 8 balls had singles written on it. – Praveen Kumar also bettered Dale Steyn for the best economical bowling for this season, which had the figures of 4-0-10-2. – Chris Gayle went past the longest six of the tournament with 111 meters bettering his own 106 meters; Abhishek Nayar was in the bowling end this time. – Chris Gayle scored the 400th Six of this season. – Chris Gayle became the third player of this season to go past 400 run mark; he is now with 407 runs. – 4 wickets victory has happened second time in this season which happed previously for Mumbai Indians against KXIP, ironically both team won the match on the penultimate ball, leaving 1 ball to spare. – Nitin Saini picked up his Maiden half century in IPL. Chennai in their home ground Chepauk and will look for a desperate win to be in the competition with more safe. Having lost their last match against KXIP, Chennai need this than anyone. KKR looking in the good nick with their skipper readily available to take the opportunity, Its KKR’s fate to lose it. Dhoni won the coin finally and decided to bat first, CSK brought Hussey back in place of Kulasekara, a costly replacement, considering the bowling weakness of CSK. Batting being the strength, CSK should have delivered for their bowlers, but on the contrary openers went too soon than expected, later Raina along with Dhoni tried to make amends in their own slow way, which in final yielded only 139/5 in 20 overs. KKR bowler were so much disciplined in their line & length, along with excellent fielding, they had CSK on the verge all the times. As always McCullum gone to an another off spinner, this time its local boy Ashwin, Morkel bowled well with pace, but both Kallis & Gambhir looked in ease in rotating the strikes and made target to look more simpler than it was. After 70 runs partnership between both, Kallis departed bit early, Gambhir got himself out, when 16 runs need, Deba Das new entrant kept himself cool to knock 11 off those in 4 balls to get a important win at this juncture. – Suresh Raina became the first player in IPL history to score 2000 runs. – KKR’s victory with 2 balls remaining is the second of this season; first one was Rajasthan Royals coming good against Deccan’s in their chase of 197. – This is third time KKR has won with 5 wickets margin of this season. – Gambhir scored the fourth fifty of this season, he is the third one to do so after Gayle & Shewag. – Gambhir also equalled the highest no. 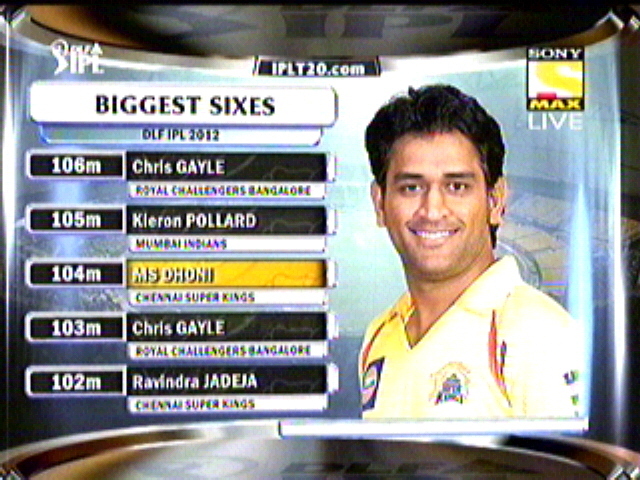 of fifties in IPL history so far which is 14, and he share it with his fellow team mate Kallis. – Raina’s 44 runs is the highest score for this season. Delhi’s prime form continued as their skipper notched up fourth consecutive fifty in IPL and some good bowling kept Delhi to 152 runs, which is a par score when you compare the batting fire power of Delhi. Chasing a total of 153 was made elegant and easy by both the opener’s Dravid & Rahane, they found boundaries when ever necessary and kept the run rate in control. At the end of 18th over Royals need 15 runs of 12 balls with 9 wickets in hand, it game Rajasthan for all taking, but out of no where Morne Morkel produced one of the best depth over to restrict it to a 3 run over with the prize scalp of Hodge in it. Rahane wasn’t bogged he tried his level best, even picking up a six in the 4th ball of last over, but still he missed the very important last ball to connect, but Naman Ojah doesn’t fail to connect the stumps and Owasis shah failed to make it to the other end. Its a thrilling one run victory for the table toppers. Deccan’s win in last game didn’t help much in their batting to improve, not to blame the batting, some class bowling from Malinga & Bhajji also didn’t help Deccan to build a partnership in a seeming wicket. Deccan’s managed to go past lowest score of this season 92 and finished the line with exactly 100 on board. Malinga picked 4, Skipper & Franklin picked a couple each. Sachin & Levi walked out to face Steyn, and Levi was gone in the very first ball of the match, Steyn didn’t stop as he followed with fiery spell to restrict Mumbai from the victory, but he failed to get the support from his counterparts who leaked runs in regular intervals. Mumbai in the end won the game by 5 wicket to spare with 11 balls in hand, if not for steyn, it would have been much more higher than it looks. – Shewag became the first player to score 4 consecutive fifty in IPL history. – 10 runs from 4 overs by Dale Steyn is the most economical bowling by any bowler for this season, he bettered Umesh Yadav’s 11 runs of 4 overs. 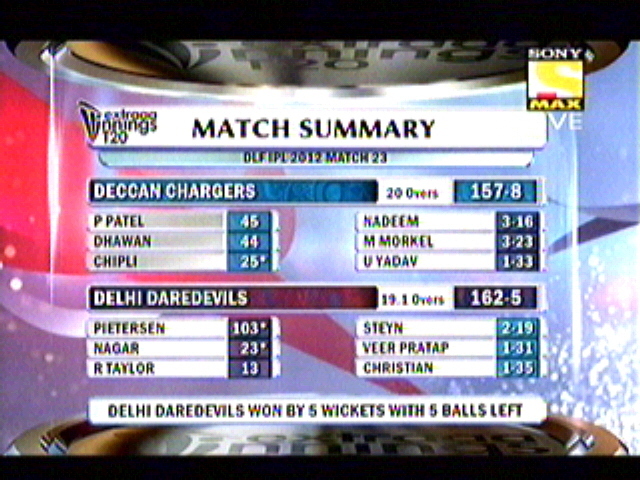 – Delhi registered the first 1 run victory for this season. 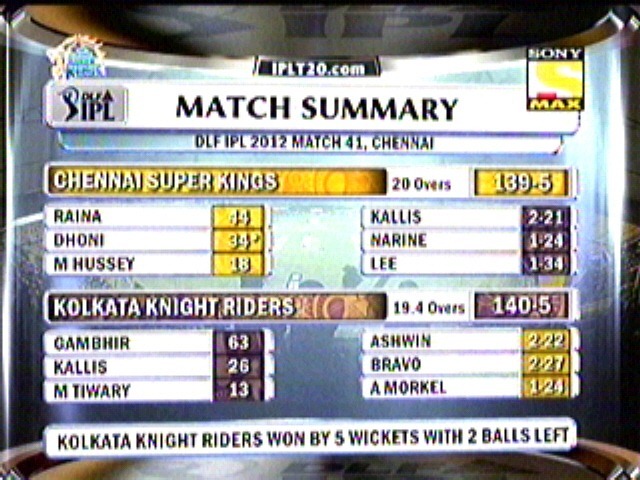 – 6th Match in IPL season 5 which went till the last ball. – Shewag & Gayle are the only two players who have scored 4 fifties this season. – Cameron Whote became the fourth Skipper to be dismissed for a duck, after Gambhir, Shewag & Harbhajan in this season. – Dravid & Rahane set the 5th 50 runs partnership between them, highest ever by any pair for this season. – Lasith Malinga became the first bowler to inflict two Golden ducks in a match, Cameron White & Veer Pratap Singh. – Rahane became the first to go past 400 runs mark in this season of IPL. – 100 runs scored by Deccan is the second lowest score for this season, just above Mumbai’s 92 runs. Nothing much to write on the KXIP performance for the day, as Hussey’s desperation and Miller’s late blow and Harbhajan’s poor captaincy all aided KXIP to score more than par score of 168/3 in 20 overs. KXIP 168/3 in 20 overs. MI 171/6 in 19.5 overs. Mumbai needed a miracle to win after losing wickets in regular and it miracle came a blessing from Chwla in the penultimate over in which both Peterson & Rayudu piled up 27 runs to win, from the equation of 32 needed in 12 balls, it became 5 need of 6 balls. It was just ritual from MI to finish the game in last over with a ball to spare. 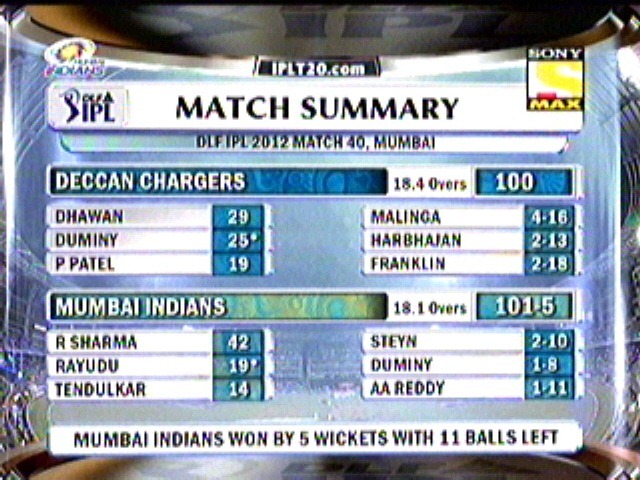 Mumbai won the game in just 2 overs of insanity. Another match in the two days to be called with any action, all we had is just toss, in which Bangalore won the toss and decided to field first. 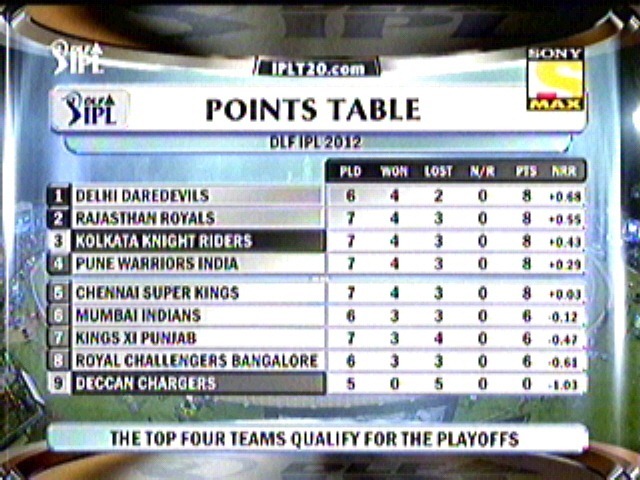 This will certainly pull down the viewership of IPL 5. This should been a cracker of an contest after the one we had in Chennai with the highest run chase for this season. 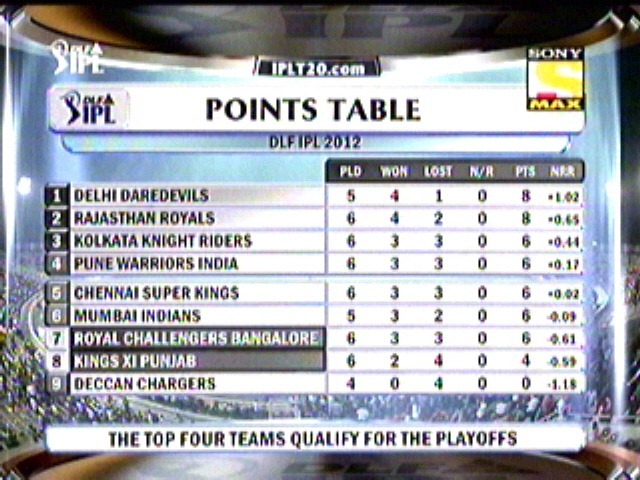 However end of the day, Now both teams will share a point each and will join the top 4 in the points table. – First match in this season to finish with 1 ball to spare and also the least no. of wickets to spare as well. – Munaf Patel bowled the 13th maiden of this season also his second maiden. – CSK Vs RCB is the second match of this season to be called off, and it will accounted for a game played, since toss is being taken. Being in a prime form, Delhi will like to continue their runs and also look for their revenge having lost their last game in a scratch. Dada’s Men will look to repeat it one more time to be in the top. Not the best of starts for Pune, as they were 2/2 losing Ryder & Ganguly early, but those are the only two wickets to fell for them, Both Robin Uthappa & Manish Pandey ensured that they stayed in the crease, but failed to get a big score for the team. As they ended up leaving 146/2 in 20 overs. thanks to some tight bowling by Delhi. PWI 146/2 in 20 overs. DD 148/2 in 16 overs. Having to chase a score of less than 7.5 runs an over is always going to be easy for a heavy batting weights Delhi daredevils, It was made much easier, once their skipper Shewag was firing in all guns. Match was over even before u could blink the eyes. As there were 24 balls left when score required was achieved. All we can say is match being called off with out being a ball bowled, but as for as Deccan Chargers in concern its their much needed first point in their points table, they make their debut with help of rain gods. 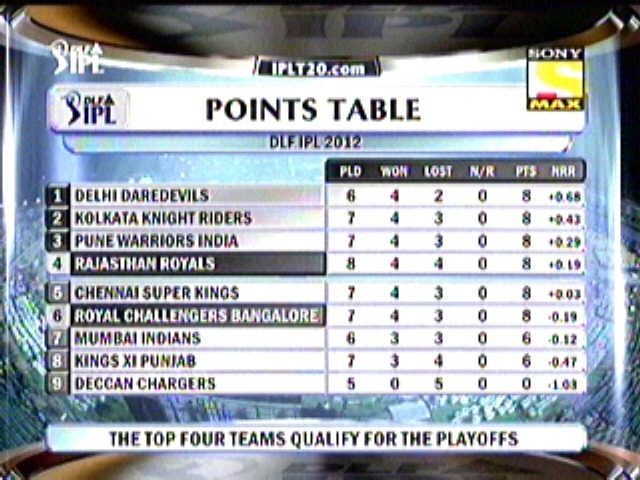 – 4 wickets fell for the match between KKR & Delhi Daredevils is the least in this season of IPL. 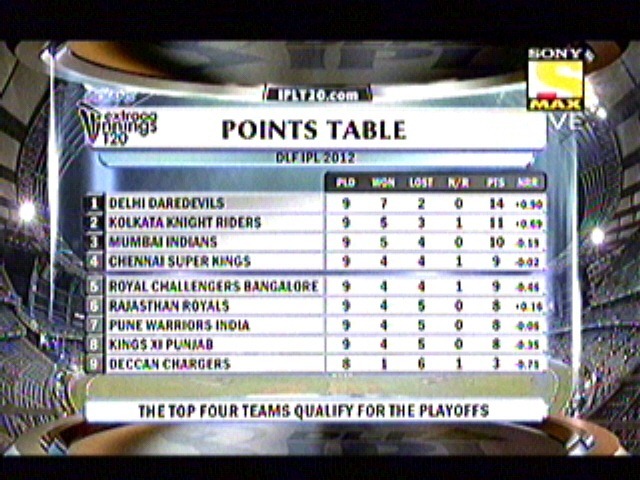 – Delhi Continues to chase and win the games, all the five games won by Delhi is by chasing. – Virender Shewag won the 8th Man of the match in IPL tournament and first for this season. – Robin Uthappa scored the slowest fifty for this season, which took 52 balls, Shikar Dhawan took 49 balls for his fifty. – 145 runs between Manish Pandey & Robin Uthappa is the highest partnership for this season bettering 131 runs between AB de Villers & Chris Gayle. – Virender Shewag scored the 300th six for this season. 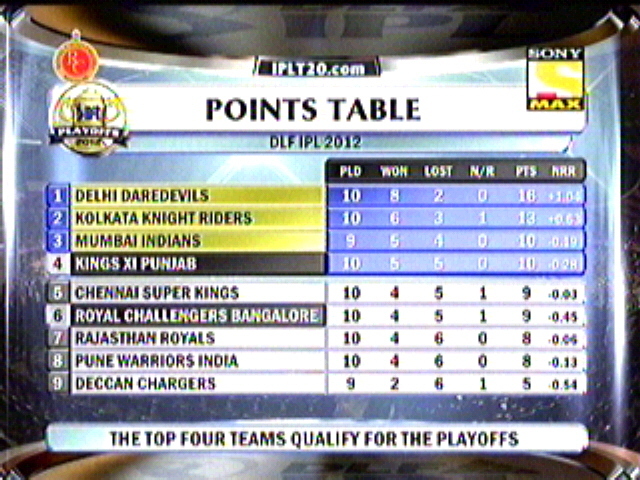 KXIP needs to win this game to be in the pool of points table, and they will face a mighty task though. Mumbai won the toss and decided to bat first, having brought Sachin back into the squad. Start was quiet slow though as they piled up close to 6 runs per over at the midway and they lost Sachin & Rohit Sharma. Some late hitting’s from Dinesh Karthik & Opener Franklin made sure MI went past the average score 164/6 in 20 overs. Need a good start to steady the innings Saini & Mandeep gave them the one, as they took 48 runs in first 6 overs. After both the openers made their way back both Aussies Hussey & Marsh built a solid partnership in the middle overs. Hussey departed to up the antiques, but Marsh along with Azhar Mahmood in the end mad sure Kings XI once again crossed the ropes safely, this is second time he brings them a victory, out of 3. As KING XI won the match by 6 wickets with 3 balls to spare. 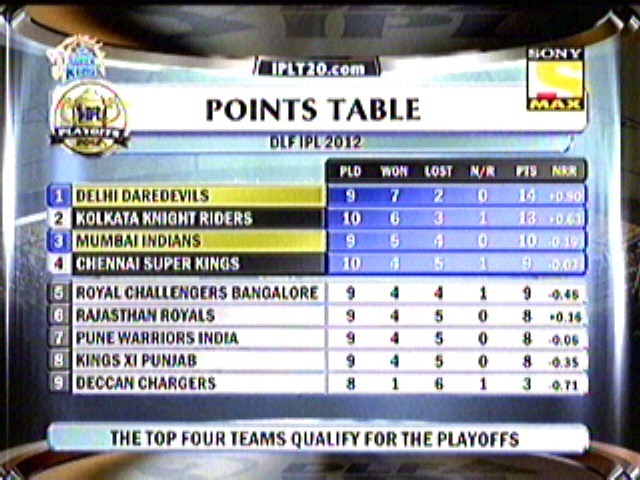 DC needing a start for this season still searching for that elusive win, KKR will look to extend their run of winning. 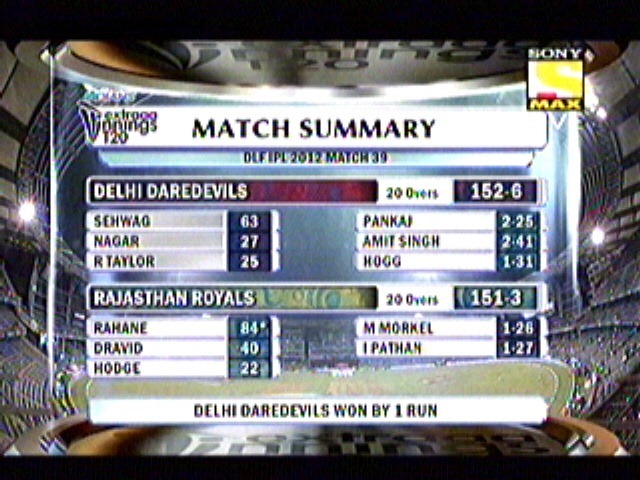 Gambhir decided to field first, Nothing much to write abt it, Rain delayed the start, but it was a 20 overs game still. Dhawan scored a fifty for himself, but none of the batsmen looked threatening, to say not even comfortable, as DC finished with 126/7 in 20 overs, Much lesser than the par score. Balaji & Lee were terrific with their pace bowling, as Lee amazed with 4 over 15/1. Knight riders had a easy chase in their hands, as always Steyn stepped up to the occasion picked up some wickets up front, but with the score like 126 u can’t do much, as KKR chased easily with 1 over and 5 wickets spare. Thanks to Gambhir & Tiwary who guided the chase smoothly. Lee got the man of the match for his fiery spell. – Out of 9 times Kings XI have met Mumbai, they have emerged victorious 6 out of 9 times now. 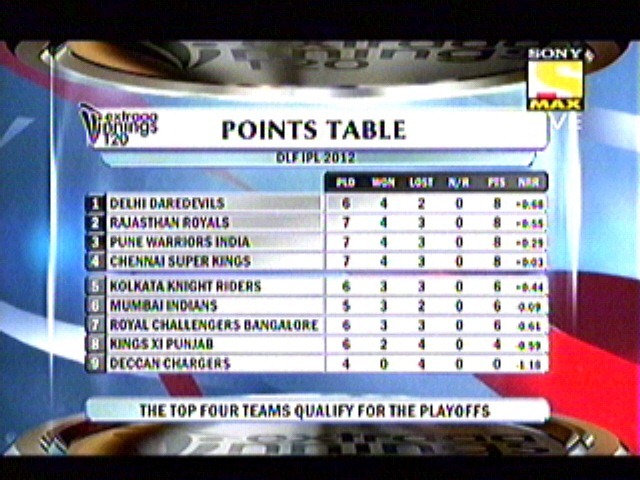 – Deccan Chargers lost their 5th game in a row now, highest no.of consecutive losses is held by KKR with 8 in a row. – Dale Steyn picked up the 50th IPL wicket; he is 12th Bowler to achieve this feat. – Fifty from 49 balls for Shikar Dhawan is the slowest for this season; he joins with Shaun Marsh who scored in same no. of balls against KKR. – Shaun Marsh scored the 14th IPL fifty and equalled with J.Kallis who has the same numbers of Fifty, which is the highest in IPL. 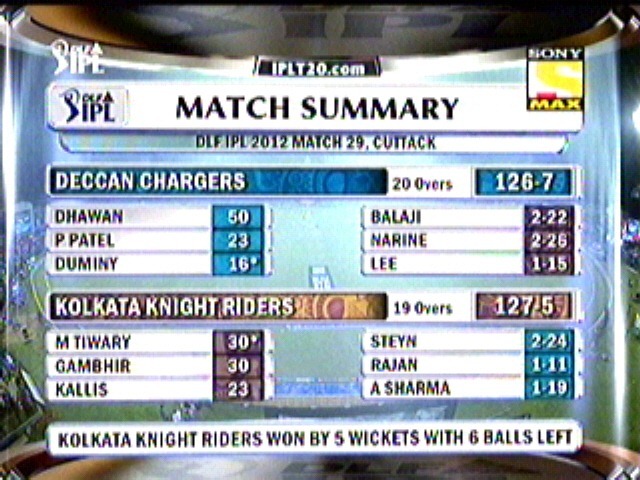 – Second match for this season to be ended with 3 balls to spare, last time it was RCB where KXIP was in receiving end. Having won the last two games Chennai will look to continue their winning stance, with this win it will be three in a row for them in their fortress Chepauk. Royals will like to ease the things and go for a win. Dravid won the toss and decided to bat first, Not much from the openers just gave a regular opening stand between Dravid & Rahane. Innings mattered came from Owasis Shah and Ashok Menaria who stitched a 92 runs partnership between them, Even though wickets were in hand for Royals they failed to accelerate the scores, thanks to some good bowling from Kulasekara. 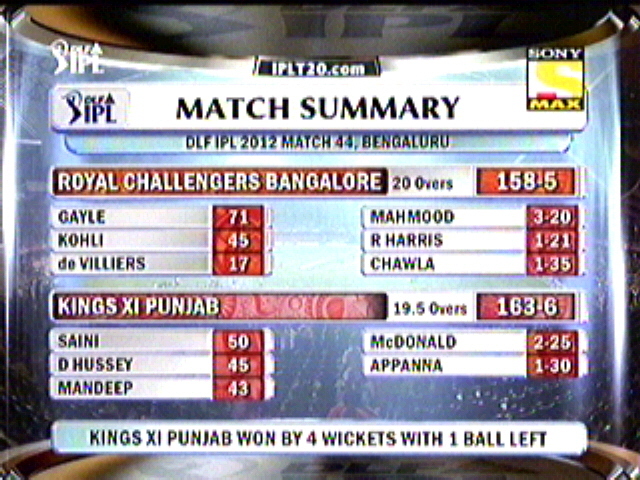 Royals finished the innings with 146/3 in 20 overs. Last year Wooden Spooners Delhi is the table toppers for this season, what a change of fortunes for them, They seems to be almost unbeatable with Bowling lead front by Morne Morkel & Pathan. Batting looking destructive & formidable with names like Shewag, Pietersen, Taylor, Jayawardene and add Pathan. The Best in the business. Dada having lost their last two games, need to win this back to get back on track. Delhi won the toss and decided to chase for the 6th time in this season, to say Delhi is the only team which haven’t batted first for this season of IPL. Pune Lost Uthappa early, but Skipper Ganguly joined with Ryder to get into a very important partnership to get PWI to a big score. They share 93 runs between them, late assault from Smith and Ryder made sure PWI reach their highest total for this season of IPL. Ryder got himself out in the last over with 86 to his name.Smith got a quick 34 from13 balls. PWI finished with 192/3 in 20 overs. Having to chase down a mammoth, Shewag & co started very cautiously and very soon they lost Jayawardene for a nothing shot, Later both Shewag & Pietersen broke loose after couple of overs, as runrate started to creep up and went on & on, until Pune’s Skipper Ganguly decided to take the matter to his own hands and oh boy, didn’t he have a golden arm as he removed Pietersen of the very first delivery he bowled, later he added Irfan also to his account, as he finished with 2/27 in 20 overs. 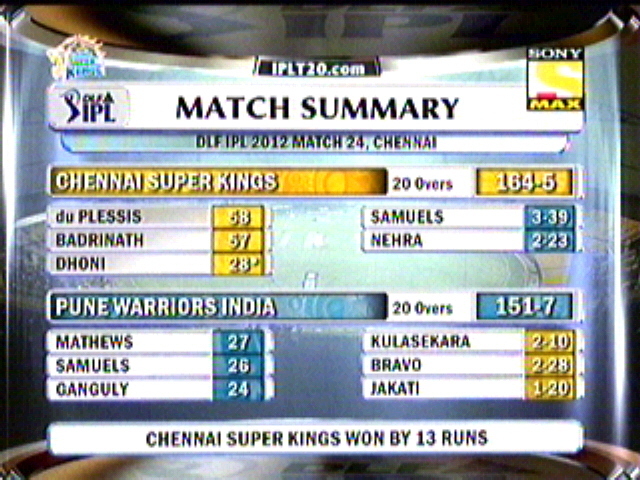 Shewag too perished to bring down the creeping run rate and Murali Karthik being the beneficiary. Ross Taylor & Yogesh nagar tried to avoid the inevitable, but some good death bowling kept DD under the target and they faced their second defeat of this season. As PWI won the match by 20 runs. And its none other than DADA GIRI all the way to win the game with 41 runs with bat, 2 wicket with ball and a catch to add the spice. – Du Plessis became the third player to score 3rd fifty for this season, others were Chris gayle & Owasis Shah. – Irfan pathan bowled the 10th Maiden for this season, and second by himself for this season. 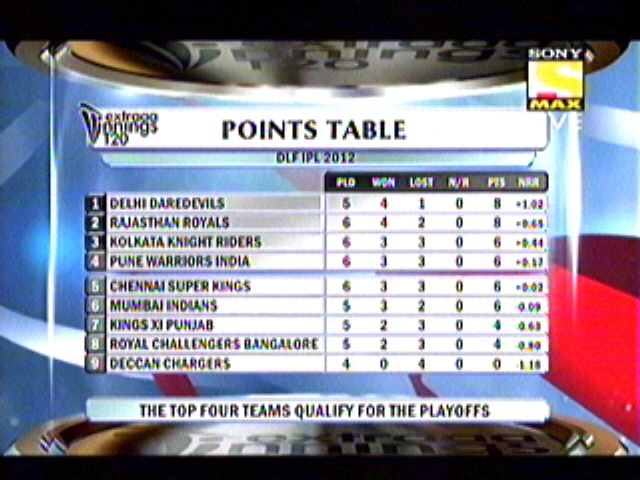 – Delhi Daredevils is the only team which has never batted first in this tournament so far. – Morne Morkel bowled the 9th front foot No Ball of this season and Jesse ryder took it for 2 runs on the off side. – 93 runs partnership between Ganguly and Jesse Ryder is the highest partnership for PWI for any wicket. – 10th IPL fifty for Shewag and first one for this season. – Faf Du Plessis became the second batsmen after Rahane to cross 300 runs mark in this season of IPL. – Fourth Match to be finished on the last ball of the innings and two times it was done by Chennai Super Kings and the others were Mumbai & Bangalore. Incidentally it is also the fourth game of this season to be won with 7 wickets to spare. – 2/27 by Sourav Ganguly is his best bowling figures in IPL so far.